Marine biotechnology has a significant potential to contribute to the well-being of the society as well as to the economic growth and sustainable development. The tremendous potential of blue biotechnology in Baltic Sea Region (BSR) is however underused and needs more strategic approaches for a full chain sector development. The recently funded Interreg BSR project Baltic Blue Biotechnology Alliance (ALLIANCE) under the leadership of GEOMAR Research Unit Marine Natural Products Chemistry aims to bring together all relevant actors for the successful development of sustainable and innovative products from marine resources of the Baltic Sea. On 1st on March 2016 the ALLIANCE project has started with a Kick-off meeting at GEOMAR, Kiel, with project partners from all Baltic Sea countries and a visit from the Joint Interreg BSR secretariat. 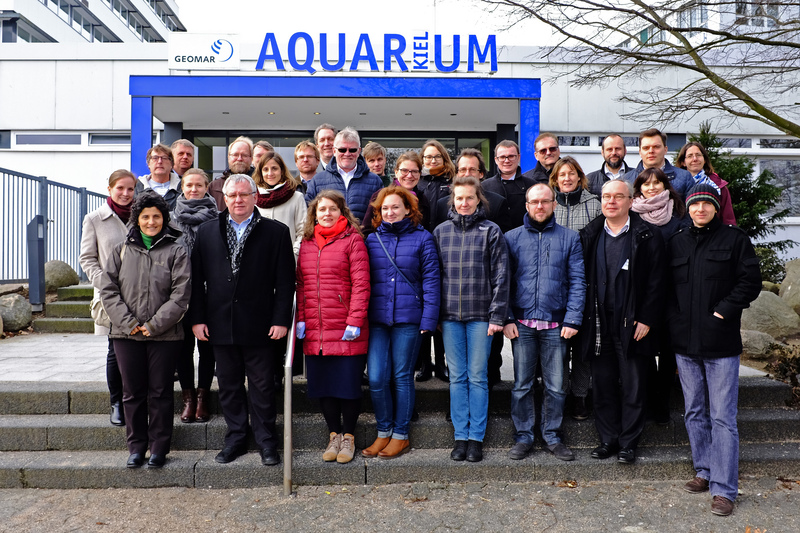 Participants of the Baltic Blue Biotechnology ALLIANCE Kick-Off meeting on 1 March 2016 in Kiel. The ALLIANCE project brings together blue biotechnology actors from across the BSR to address key challenges and opportunities and develop innovative marine bio-based products and services. The ALLIANCE project will advance sustainable blue growth in the BSR by facilitating a selected number of concrete successful demonstration cases for transnational development of commercial blue biotechnology products in the whole BSR. The project has 22 partners from renowned BSR blue biotechnology research institutes, biotechnology hubs, business parks and the SUBMARINER Network. In addition, selected partners from other European countries bring in pan-European expertise. Together they cover all BSR countries and offer the critical mass of interdisciplinary expertise in all blue biotechnology fields such as natural product chemistry, marine biodiscovery, biology of marine invertebrates, macro- and microalgae, process design, aquaculture, genomics and the various fields of application, such as biofuels, food and cosmetics. Moreover, academic partners – including GEOMAR – possess excellent research infrastructures, pilot/testing facilities and biomaterial to be offered to the ALLIANCE to speed up success cases for product development. This is complemented by competence in business planning, technology consultation, sales and marketing, patent profiling and legal advice, all equally essential for development of product value chain. The ALLIANCE contribute to the realisation of the full potential of the blue biotechnology sector by creating a permanent BSR-wide hub with a financially viable, target group oriented integrated service offer. The visibility of its activities and success stories will showcase perspectives of blue biotechnology. The project coordinator Prof. Dr. Deniz Tasdemir says: ‘’I am delighted that our transnational ALLIANCE project is one of the projects that have been selected for funding out of 78 applications by the EU Interreg Baltic Sea Region Programme. We look forward to boost blue biotechnology in the Baltic Sea Region and Europe-wide, and contribute to blue growth and bioeconomy.’’ All funded Interreg BSR projects start in parallel in March 2016.